How lucky to have a bee keeper for a neighbor! These sounds fantastic to me, even if you say they aren’t your absolute best. Blogging does take lots of time. It’s great that you have time to do it at all. These are lovely. And even though it’s not quite what you envision, I am still going to give them a whirl…I have a thing for sweet/salty combos. wow, these look great! 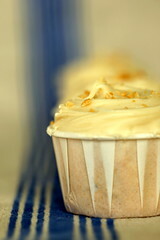 I just signed up for the cupcake swap – looks like it will be lots of fun! The fact that you’re baking at all–with everything else going on–amazes me! And I’m sure they’re pretty damn delicious compared to most cupcakes in the world :) I recently made your s’mores cupcakes for a friend’s party and they were a huge hit. Thanks for sharing all your great ideas. I’d rather see an awesome post and recipe once a month than something every day that’s posted just to get a post in. I love your blog and it’s always a treat to read. One day I may actually try baking something, but for now I just read and drool. This sounds like a really tasty and simple recipe. I will definitely give this a try. I do have a question for you: is there a reason why you poured the wet ingredients into the dry ingredients instead of adding the dry ingredients to the liquid a little at a time? Does it matter in terms of texture for the finished product? I’m curious because I’ve never made chiffon before. honey and peanuts always make me think of christmas, strangely. i think it’s cause we get the german market around that time here and one of the stalls always sells a range of candied nuts. :) thanks for this post! Just the title of these cupcakes made my mouth salivate. How delicious! Not only have you created another wonderful cupcake concoction but you now officially have the first sentence for your memoirs. “My neighbor is a bee keeper” is as good as “Call me Ishmael”! 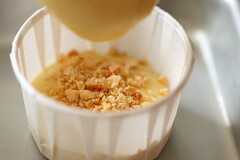 And I love how you did a honey cream cheese–a great combo and nice to mellow out the flavors. I totally agree with Fran. Don’t post just to post. Post when you can, and continue to post excellent and inspiring recipes. Your Horchata cupcakes are my favorite. I make them all the time. One question for you. When do we get Part 2 of your Frosting post? I’m anxiously awaiting your thoughts on techniques and FAQ’s. Thanks for keeping me baking. Honey cream cheese frosting sounds amazing!I love your posts! You are amazing! Like everyone else said, knowing that you have a post really brightens our day. I really look forward to all your posts, and although I haven’t made one yet, I really look forward to receiving an e-mail notification that you posted a new cupcake recipe! Please keep doing what you’re doing…it’s a joy to see your creations. I love the idea of putting the peanut and salt layer in the batter – very clever and sounds delicious. Can’t wait to try this out. Just joined your cupcake group but can’t make it to the first meeting :( am hoping to come to the next one. Who knew there were bee keepers in the city? These cupcakes look awesome. I think I will be making them for Easter. Everytime you post a new recipe, it’s like a getting a little gift. And gifts are special because we don’t get them everyday! So, please don’t worry about the quantity of posts, stick to what you know and do best – quality! How nice to have a supply of fresh local honey. I think the cupcakes look perfect. I like the idea of layering some nuts inside, I bet that provides a nice little textured surprise inside! I’m fortunate to have a couple of local apiaries near me. Until I moved to this area, I didn’t realize that honey could be as complex in nature as wine! Even the time of year it’s harvested can greatly impact the flavor. (It gets darker as the year goes on .) I have a jar of honey from one of those places sitting in my baking cupboard, and I think this is the perfect way to use it up. I love sweet and salty together! Your cupcake has been chosen for ATC’s Weekly Cupcake Collection! Click the link to see more. Looking forward to your next cupcake creation! Even if you never post another recipe, I for one will still visit this blog, because your archive will always be fantastic. You have so many killer recipes, you should be proud :) and ps I used this frosting on some almond cupcakes, absolutely divine. i want to live near enough to a beekeeper to get local honey, but no so near that there’s a chance i might have to interact with the bees. i also want to live near you, so you can pawn off your cupcake experiments on me. salty pnuts and honey, drool! I love your blog! I enjoy reading it! I am definitely going to try this recipe! I am also a cupcake fan! Im not a very good blogger but I think thast because Im always reading and chatting with everyone else! hehe! Anything with “sweet” and “salty” in it has to be good. I really liked the flavor of these, but I had some trouble with the recipe. For me, they only needed 10 minutes in the oven before the toothpick came out clean, and even then the bottoms got a little dark. Even on the top shelf. Also, the frosting recipe only made enough to frost half the cupcakes, and that was even with a modest amount. Maybe I did something wrong. I have made at least 20 of your recipes and this is the first I have ever had trouble with. Even with troubles, they tasted delicious. Keep up the good work! I am about to bake these for a picnic on sunday, does this really make nine? it seems to be a lot of egg for nine cupcakes? Hmm….. I’ve been eyeing your recipe for hummingbird cupcakes with cream cheese frosting, I have decided to make them for a friend’s birthday. I wonder how they would taste with honey cream cheese frosting? I think I’ll go for half and half and decide that way. I’ll let you know! I think thise frosting would go amazingly with a mango cupcake! Hi. I was just reading through your recipes and noticed that many call for creamcheese in the icing. I, personally, am not a fan of creamcheese. Can these recipes be altered to not include creamcheese? Would I just add more butter? Yes, just make buttercream which is butter, confectioner’s sugar, a little milk, and whatever the flavoring is.